You cannot go wrong in our house with a book that starts with a sentence Smarty loved books. Seriously, I think I am going to get The Jellybeans and the Big Book Bonanza for our home book collection. It seems to be written about my daughter and its author Laura Numeroff is one of our favorites. The only difference is that my Smarty is not really shy and she doesn’t have such a good group of friends yet. It’s ironic that I lived in Brooklyn, NY for five years, went to Coney Island Beach many times in the summer, but have never heard of Mermaid Parade until Mom and Kiddo reviewed Mermaids on Parade in her Urban Books series. When I was reading it the first time Smarty kept asking if the narrator is going to win the prize – my girl definitely has a bit of type A personality and will go an extra mile if there is a hope of winning something in a contest. Luckily, the girl in the story won the prize, which immediately propelled the book to the top of Smarty’s favorites and earned it a spot in her bed. Smarty chose The Philharmonic Gets Dressed as her reward book for completing her summer reading program in the library. I was amused to see that it was published almost 25 years ago – I wonder where it was all these years. I have a hunch that it wouldn’t be published today – it has fairly explicit illustrations of adults in various stages of getting dressed – starting with them taking a shower, then brushing and trimming, then putting on their underwear, etc. The vocabulary is very advanced, and the book is rather long. Nevertheless, Smarty was pleased with her “prize” and we ended up reading it many times this week. It is so cute that she takes the books to bed. It continues to amaze me how many of our interactions change with the development of independent reading, like determining their favorites. I haven't had a chance to write up a post yet. I hope to get to it today. We love Laura Numeroff too! I love to read books for children that were published before everyone was so politically correct and afraid of everything! You've done it again - reviewed books that I think my daughter would also really enjoy. I have added them to our list. Savvy also likes to pull down dozens and dozens of books from her bookshelf during rest time. That is a beautiful picture of you and Anna in your previous post. The firefly craft looks like such an enjoyable craft to do and I really like the fact that you can have so much fun with your creation once it has been made. I read with interest your tip about prolonging the life of a glow stick. Anna's quotes made me smile, I especially chuckled over her saying "I love you too medium sized mother". Felt boards are very popular here too. Savvy creates her own stories and Blakie loves it when I use them to make up stories. They are such a versatile resource to have. I just put a Laura Numeroff book on hold, too. I had no idea she had so many books outside of the if-you-give-a series. Selena use to take books to bed with her until she lost the one between the bed and the wall, too tramatic you know! She does however lay for long periods of time on the couch and reads. I always find books that I think Selena would enjoy from your posts. Matthew loves to take books to bed too. :) It's such a great way to get him to go to bed on time, lol. I really like the look of How to be a Friend, and it sounds like one we'd definitely like (and a subject we probably need to learn about), but I really don't like reading comic strip type books - I think I'll save that one for when he can read on his own! What fun book! I love the Tiger Tales books. My son loved getting a box of books. It has been the best thing we have received from blogging. The Jellybeans looks good. Going to look for that soon. So glad Anna enjoyed Mermaids. I have that Philharmonic book but haven't gotten it out yet. I should do so. Yay - glad that you enjoyed the friend book. We've renewed it for further review! Hi! I just wanted to leave a note to say I'm very excited about joining in. 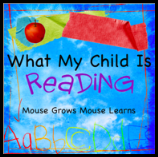 I love children's books and really have enjoyed finding books for my children to read. It helps immensely to see what other folks are reading. Last year I was struck by the lack of lists out there on the web and came up with my favorite 15 books at that time - http://croomnfp.blogspot.com/2009/08/15-best-books-for-babies-and-young.html - I think I would change it now!